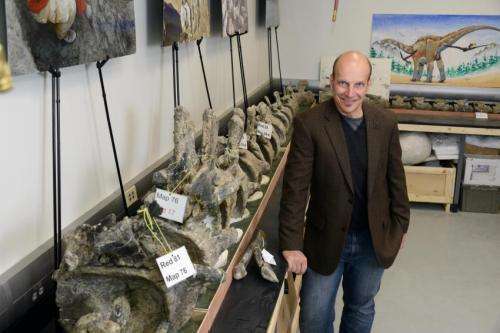 Scientists at the University of Liverpool have shown that the most complete giant sauropod dinosaur, Dreadnoughtus, discovered by palaeontologists in South America in 2014, was not as large as previously thought. Found in Patagonia, the huge fossil had almost all of the major bones intact, allowing scientists to confidently estimate its overall size - measuring in at 26 metres long. The team used a three-dimensional skeletal modelling technique to examine body mass more directly. This method involves mathematically reconstructing a 'skin' volume around bones of Dreadnoughtus on a computer and then expanding that skin outline to account for muscle, fat and other tissues. Dr Karl Bates, from the University's Institute of Ageing and Chronic Disease, explains: "Estimating the body mass of an extinct animal from approximately 77 million years ago of this size from only its fossilised bones is extremely challenging and relies on the availability of certain data from living animals and modelling techniques. "The original method used to calculate the mass of the animal is a common one and has been used successfully on many specimens. The highest estimates produced for this particular giant, however, didn't quite match up. "Using digital modelling and a dataset that took in species, alive and dead, we were able to see that the creature couldn't be as large as originally estimated." "Our analysis suggests that only the lower estimates produced by previous methods are plausible. Estimates of 60 tonnes and above do not fit with our current understanding of the mass characteristics of living land animals."